We are looking for individuals to join our team as customer service representatives to work the front end of our operations. This is a seasonal position that requires extensive traveling, working in a fast-paced environment, and required the handling of money. 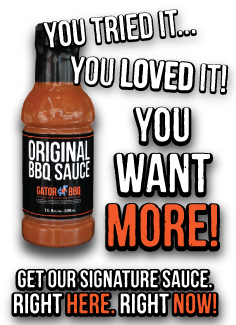 Gator BBQ Company travels across Ontario, parts of the United States and expanding into the Western Provinces selling our products during; Ribfest Shows, Fairs, and Exhibitions. Training is provided. If you are looking for a challenge with above average pay, then download and complete the PDF application and send it with your resume via e-mail to jobs@gatorbbq.ca You can also complete an online application. Both are found below.